Thomas Hegghammer and Cole Bunzel will speak at the 9/11 Memorial Museum. The Sphere in Liberty Park, in view of One World Trade. Photo by Jin Lee, 9/11 Memorial. The 9/11 Memorial & Museum relies solely on the support of visitors and generous donors. Photo by Jin Lee, 9/11 Memorial. Left: Photograph of James Anthony Trentini coaching on Thanksgiving Day (1985). Right: Photograph of James Anthony Trentini raising a trophy after winning a Thanksgiving Day football game (1982). Collection 9/11 Memorial Museum, gift of Joe LeVasseur, friend of James Anthony and Mary Barbara Trentini. Above: George William Morell, his wife and his four children on a trip to Hither Hills, N.Y., in August 1999. Collection 9/11 Memorial Museum. Robert D. Cirri, Sr. seated next to his wife, Eileen, on their engagement date. 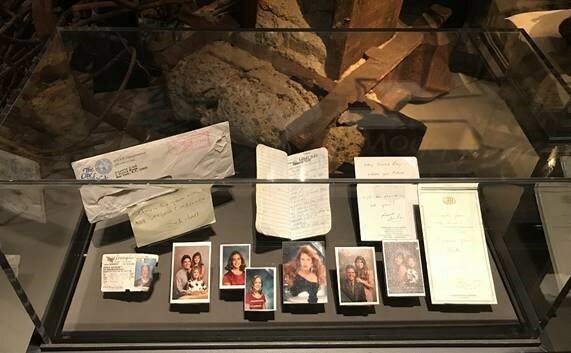 Collection 9/11 Memorial Museum, gift of Eileen Mary Cirri. New artifacts on view at the 9/11 Memorial Museum. Photo by 9/11 Memorial Museum Staff. The exhibition “Rendering the Unthinkable: Artists Respond to 9/11,” on view at the 9/11 Memorial Museum. Photo by Jin Lee, 9/11 Memorial. Representatives from the U.S. Navy holds a flag-folding ceremony on the 9/11 Memorial Plaza during Salute to Service week. Photo by Jin Lee, 9/11 Memorial.